It’s fair to say that the kids have broken me. Why on earth I thought two night owls would have children who went to bed early, I have no idea. None at all. They are as averse to early bed time as their parents. Last night, after various attempts to get them both to bed by eight, by first putting Elle on my back while reading a book to Roz; then getting both of them into bed with me while I read a story, then giving up and letting Elle wander around on the floor while Roz read her book and I went on twitter, I just gave up. Bedtime be damned. Small girl fell asleep at ten, smaller girl at 10:30. By that time it was time for me to go to bed. I opened my novel, found my page and that’s the last I remember before being worked up sometime in the middle of the night for a feed by smaller girl. Me time, zero. I’ve been like a small child starting creche over the last few weeks in work, getting a cold every week and dragging myself around in the evenings, high on vicks fumes and lemon tea and surviving on sleep broken by the teething baby and various attempts to blow runny and stuffed nostrils. Don’t you just hate those kinds? when one nostril is dripping mucus and the other is blocked tight? I had to sleep with tissue taped to one nostril so I wouldn’t wake up glued to the pillowcase with snot. I decided to give up on summer and just put my winter coat back on. It’s kinder to me, and stops the illusion of summer that we’ve been having the last few weeks. My heavy coat came out of storage and kept me dry and extra warm in the week that turned to rainy wintry days. I put my boots back on, just to really push the point home – that week in May where the sun shone every day, that was summer. We’re in autumn now lovey, and winter is coming. The walk to the bus stop, and on the other side, from the bus stop to work, is currently giving me all the exercise I can manage. Dodging snails and slugs on the path is my favourite thing. I hate snails with a passion. They’re beautiful to look at, but make the most disturbing sound when stepped on. It’s like this weird screech that pierces through your brain and goes on well after they’ve been flattened. It’s the crunch that I can’t stand. I’ve only ever stepped on snails three times in my whole life. The first time, I was ten, it was the rain season and I was walking barefoot. The feel of that shell breaking, and the squishy innards oozing out will haunt me till my last day on this earth. The second was in my sister’s garden last year as I supervised the kids and talked about how there didn’t seem to be many snails about. And ironically, the third was as I told my nephew just how much I hated stepping on snails because I couldn’t get the crunching sound out of my heard from circa twenty five years ago. How he laughed. Luckily the last two times I had shoes on. The only thing, I discovered very recently – like last week recently – worse than stepping on a snail, is stepping on a slug. And the only thing marginally worse than stepping on a slug, is stepping on a slug with bare feet. And the even worser thing than stepping on a slug with bare feet is stepping on a group of slugs. 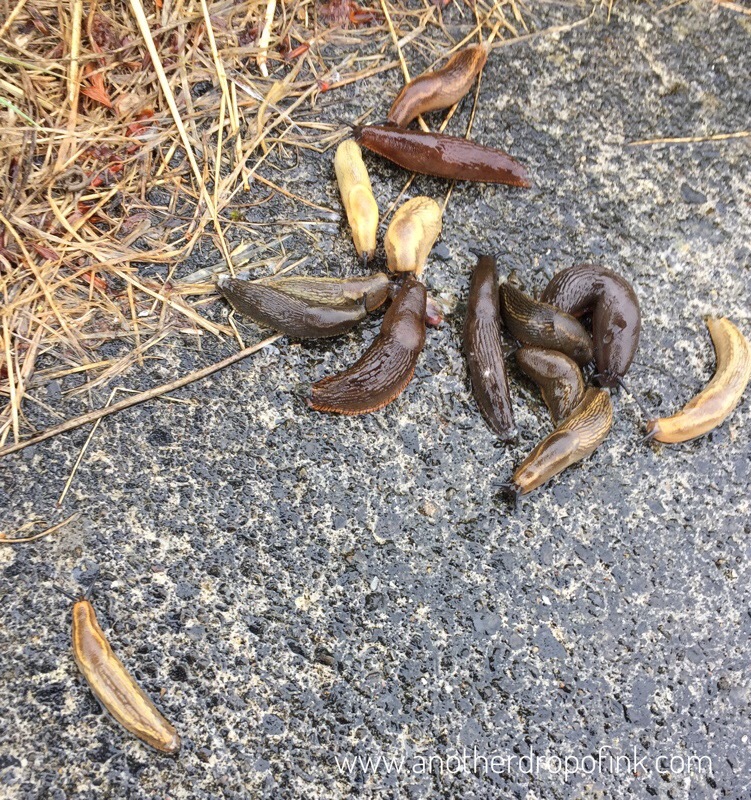 While taking a picture of another group of slugs. See? Load of them in horrible little groups on the path. What, you think I go around doing this on purpose? They are all over the path on my walk to work. Like everywhere. And for some reason last week, they were also in groups all over the path, slowly slooshing their way around (is slooshing a word?) huddled together, taking up all the space so that a person who had worn the wrong shoes that were now destroyed and could never be repaired, was forced to step on them. It was disgusting. Dis. Gust. Ing. Needless to say, the shoes went into the bin, and I now watch the ground like a hawk every time I walk. 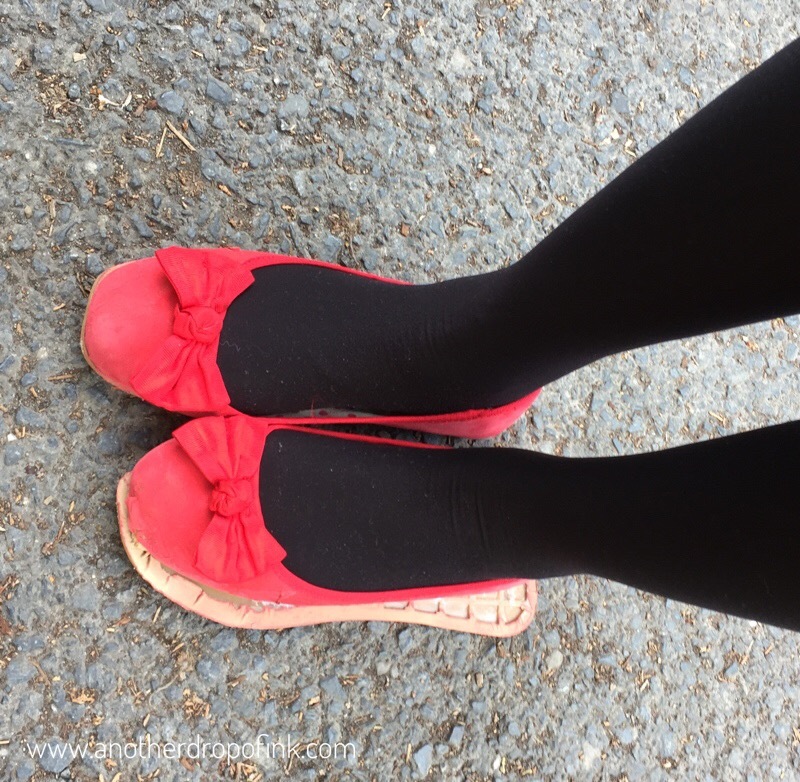 My beautiful red shoes, destroyed! Good thing I was smart enough to buy two pairs.